The lamp above this plaque was formerly used to light a street in West Berlin. 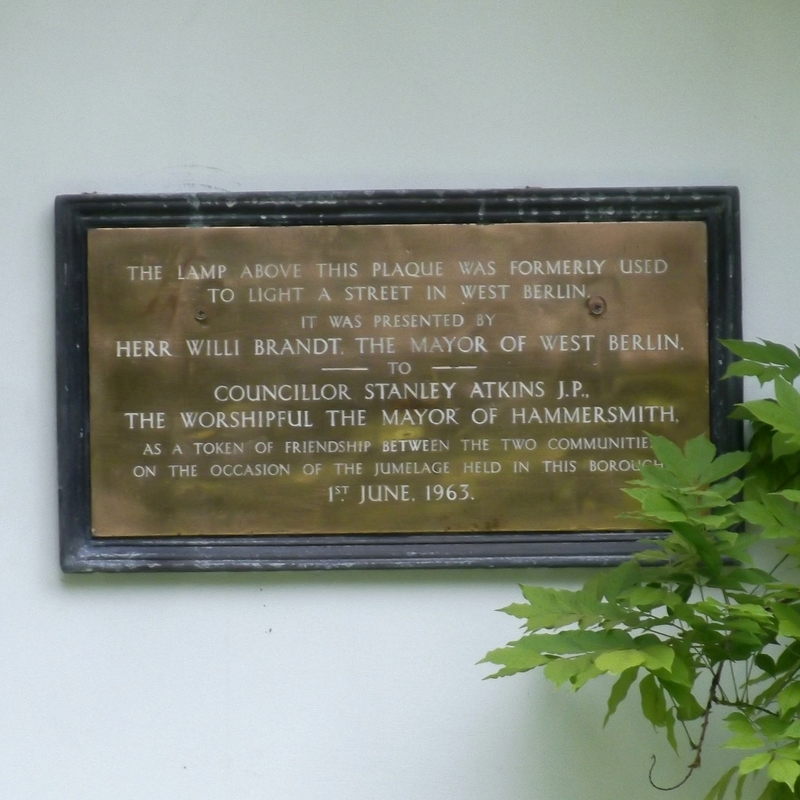 It was presented by Herr Willi Brandt, the Mayor of West Berlin to Councillor Stanley Atkins J.P., the Worshipful the Mayor of Hammersmith as a token of friendship between the two communities on the occasion of the jumelage held in this borough. Hammersmith & Fulham has been twinned with Neukolln (a borough of West Berlin) since 1955. "Jumelage" is French for "twinning", and perhaps (we're struggling here) used in German for the concept. 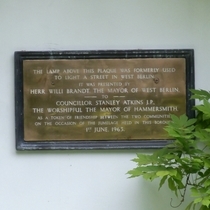 See Plaques of London for a close-up picture of the lamp at the time of the gift, though it looks more as if the mayor and others are squabbling over it. July 2017: The lamp and plaque have gone. We've made two visits, hunting all over Furnivall Gardens but found nothing. Thankfully no one asked what we were looking for: "we've lost a street lamp" might have elicited some strange looks. All the foliage has gone too, leaving a white wall with a few neat, low, plants. We wrote to the Council and asked what was happening. To our delighted surprise we received a reply, saying that the lamp is being refurbished and will return. Please let us know if you see it back in place. June 2018: the lamp is back, with a new plaque, which we predict will shortly be hidden by foliage. The text is identical to that of the original. Wikipedia explains about twin towns, etc. Site of former Bull and George Hotel 18th century coaching inn.